It is always a thrill to see this large, brilliantly red-crested woodpecker (Dryocopus pileatus). 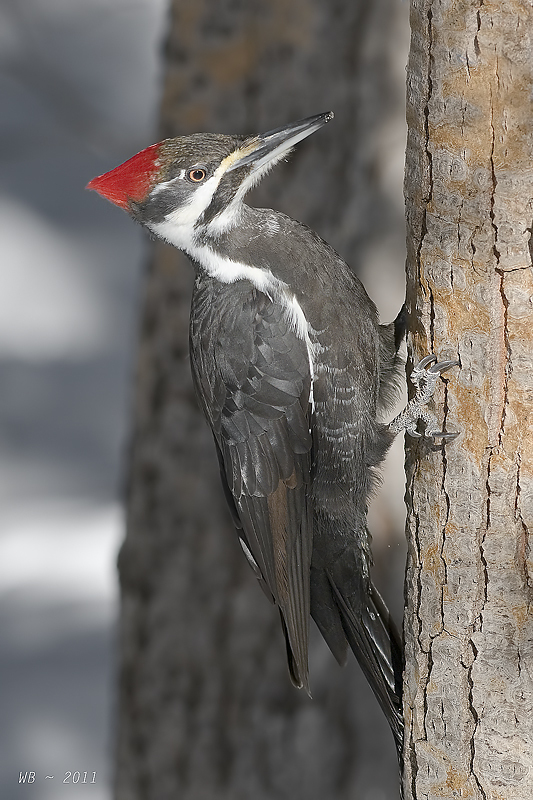 In the Edmonton area we are lucky that this distinctive woodpecker can be heard or spotted all year, especially in the forested river valley, the many ravines, and in city parks with stands of old trees. 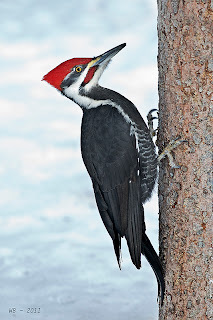 Several times a year they even come around to my feeders at home and they are regular visitors to a treed quad just in front of the building in which I have my office at the University of Alberta. Yesterday, this pair spent about an hour near the birdfeeders, including some suet treats, at Hawrelak Park, adjacent to the South Saskatchewan river in south Edmonton. Normally these birds are quite shy and wary. On this day they seemed not to mind being approached, perhaps because they were too interested in each other. It is early mating season for these guys. 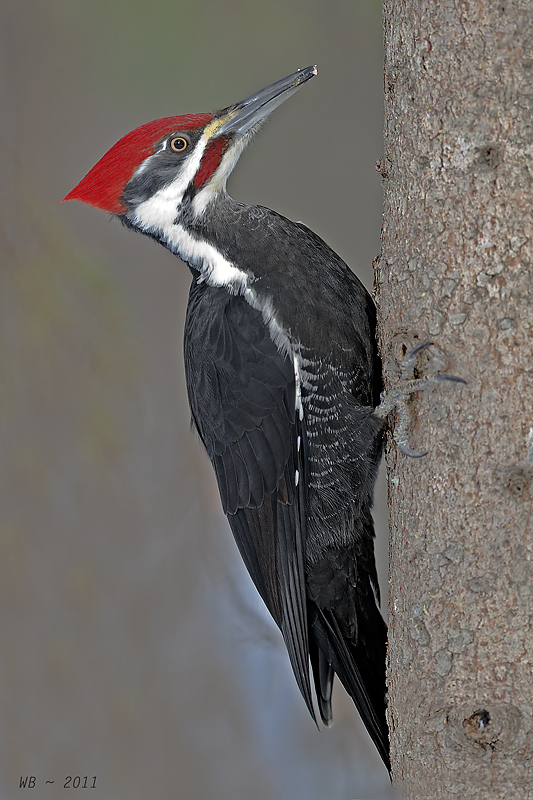 Male and female took turns flying about 70 feet up a poplar tree, throwing their heads back, and clucking while the mate listened and watched from nearby. Males and females are easy to tell apart. The male has a vivid red crest extending from the bill to the nape and a distinctive, easily noted red moustache mark extending from the bill. Females are a bit smaller than male and with a forehead that is gray to brown and, for me the most tell-tale fieldmark, no red moustache. 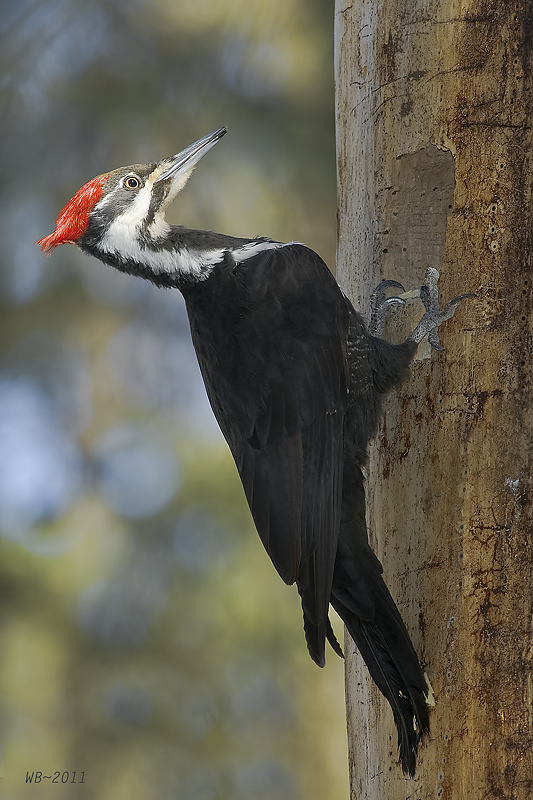 The Pileated Woodpecker's choice of meal is carpenter ants. Large rectangular holes in dead wood are signs of a Pileated Woodpecker's excavations for these large ants. They also eat other insects, supplemented by seeds and fruit. Excitingly, they will also come to suet feeders. 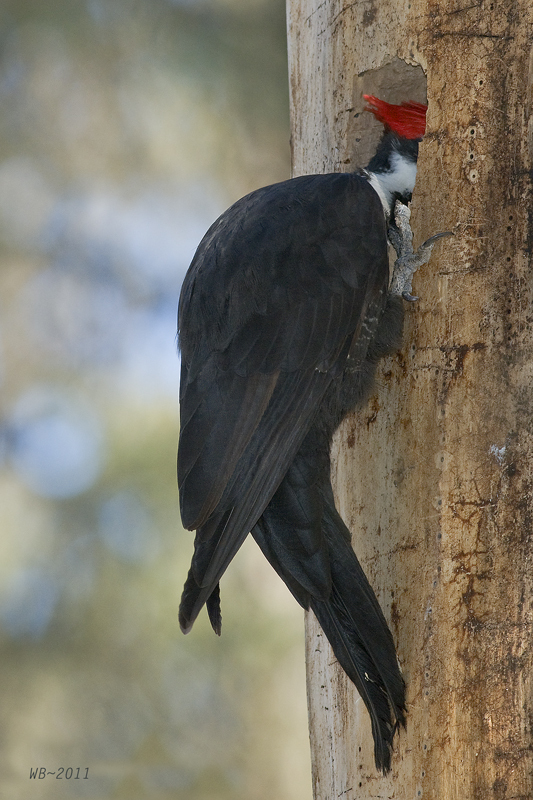 Nests are excavated 15 to 70 feet high in a large dead tree. The unlined nest cavity may be as much as 24 inches deep. Both parents incubate three to five eggs for 15 or 16 days. The young may take a month to fledge. Last summer I had discovered a nest in a cottonwood tree and had looked forward to watching the hatchlings emerge, but then travel intervened. Perhaps this summer. An interesting quirk about this species is that they excavate square holes. Here is an example of a female preparing a cavity in a dead cottonwood trunk. It is nearly nesting season so I will watch this one to see if this will turn into a Woodie Condo.